Pardon the horrid analogy, but Cinecultist was caught up in the Tim Burton's Big Fish end of the year awards-hype like a mammoth catfish on a homemade fishing line. There's something about the phrase, "Tim Burton's Masterpiece" intoned on the television commercials that will lure CC into theater every time based purely on fond memories of Pee-Wee's Big Adventure, Edward Scissorhands, Ed Wood and Sleepy Hollow alone. We won't say that our Burton itch wasn't scratched by parts of Big Fish, but in the end CC expected a more typically dark twist than this sweetly Oedipal story delivered. 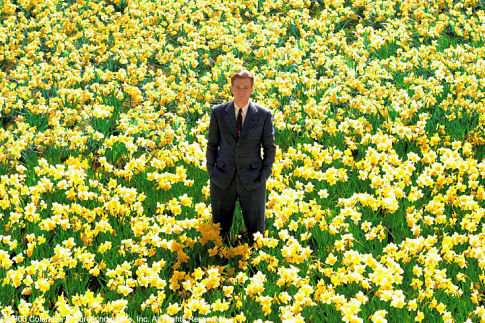 Told primarily in flashback/tall tale, Big Fish brings to technicolor life the experiences of another Ed, this time Edward Bloom (Albert Finney/Ewan McGregor) as told to his son Will (played as an adult by Billy Crudup) throughout his life but painfully resented for their exaggeration as a grown-up. Visually, the movie soars when allowed to play in these fantasy sequences as Burton and his production team concoct stunning, elaborate sets pieces for them. In particular, the part where WWII combatant Ed lands in an Asian vaudeville show complete with barking ventriloquist is delightfully witty as well as gorgeous. But all of this loving attention to surface detail leaves a few holes in back-story and character development. As the investigation by Will plot sets out to debunk some of Ed's stories with real life truths, the story could have plumbed some darker depths regarding his father's double life and the escapist impulses of a life-long story teller, but doesn't. Instead Burton chooses to linger his camera on the patiently hagged-uped face of his real-life girlfriend Helena Bonham Carter (look honey, this time I didn't make you look like a monkey!) and sticks us with a heart-warming ending when we're not looking. Some people might find their cockles warmed and their strings tugged by this kind of father-son bonding junk, but Cinecultist wonders if those people are a true Burton acolyte like they say. CC thinks we'll hold off on dubbing Big Fish an "instant classic" but it is still worth a holiday time viewing if your schedule allows.